Human religion, denominationalism, insists upon trust in the Divine Son of God. "Put your faith in him," they say. "Do not trust in `a plan' of salvation, but in `the man' of salvation." Generally, by this pious plea, they mean that one may, yea, must, ignore the gospel plan of salvation, i.e., baptism. Thus, Christians are made to appear as those whose trust and hope is in an ordinance, or in the water, and not in Christ. What shall we say to this? First, none who believe the Bible will disagree with the theme and thrust of trust in the Lord. We must "trust in the Lord" (Psa. 37:3). This "trust in the Lord" must be "with all thine heart" (Prov. 3:5). "They that trust in the Lord shall be as mount Zion, which cannot be removed, but abideth forever" (Psa. 125:1). We dare not trust in men, for "cursed be the man that trusteth in man" (Jer. 17:5). "It is better to trust in the Lord than to put confidence in man" (Psa. 118:8). Further, "we should not trust in ourselves, but in God" (2 Cor. 1:9). 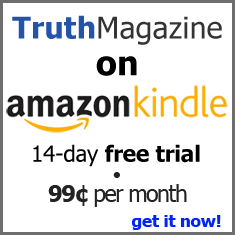 New Testament converts "trusted" in Christ (Eph. 1:13). Second, even human reasoning and human illustrations show that trust in a person involves and includes trust in that person's word. When my boys were little and standing on a high place, I would say, "Jump, and Daddy will catch you." They believed me, trusted me; so, with confidence and trust in my word that I would catch them, they jumped. Because of trust in the national weather service's warning of an approaching tropical storm, thousands will close up their homes and leave a coastal area. Leaving reveals their trust in the forecaster and in his forecast. Though it may not be windy or raining, we board up our houses upon the word of a meteorologist that a storm is approaching. The decision of one man, one doctor, causes us to undergo painful, expensive surgery. Because we trust in him, because we have confidence in his word, we agree to very disagree-able procedures. At such times, do we deliberate and debate about whether or not our faith is in the doctor, personally, or in his practice, or in his profession, or in his pronouncement, "You need surgery"? No, we do not. Though we "never felt better," we put our affairs in order, check in the hospital, and have surgery. Better than human philosophy is Divine testimony. Letus study several cases or incidents where men are said to have believed or trusted in the Lord. Let us see how this trust was exhibited, expressed. By the Bible we shall show that one trusts and believes in the person of God when he obeys the purpose, the plan, and the pattern of God. Conversely, those who do not yield and submit to the word of God are those who do not trust and surrender to the person of God. Moses  In Numbers 20, God told Moses to "speak" to the rock to obtain water. Moses "spake unadvisedly with his lips" (Psa. 106:33). Consequently, God said, "Because ye believed me not to sanctify me in the eyes of the children of Israel, therefore ye shall not bring this congregation into the land" (v. 12). Did Moses believe in the existence of the person of God? Certainly, he did; yet, God said, "ye believed me not." When one does not obey the word of God, he does not believe or trust in the person of God. Israel  When Israel "rebelled against the commandment (or word ) of the Lord," they "believed him not" (Deut. 9:23). When God saw Israel's disobedience, though they were "his sons and his daughters," he said, "they are .. . children in whom is no faith" (Deut. 32:19, 20). Did they believe in the presence of God's person? Yes, but in disobedience to the word of God, they were "children in whom is no faith." When "they would not hear" the plan of God, they "did not believe in the Lord their God" (2 Kgs. 17:14). "Then believed they his words; they sang his (God's) praise. (But) they soon forgot his works; they waited not for his counsel (for his words) . . . They despised the pleasant land, they believed not his word" (Psa. 106:12, 13, 24). "But they have not all obeyed the gospel. For Isaiah saith, Lord, who hath believed our report?" (Rom. 10:16). If one does not "obey the gospel," he does not "believe" the gospel! Those who have "obeyed the truth" are those "which believe," while those who do not believe are those who "stumble at the word, being disobedient" (1 Pet. 1:22; 2:7, 8). "I will therefore put you in remembrance, though ye once knew this, how that the Lord, having saved the people out of Egypt, afterward destroyed them that believed not" (Jude 5). Who were those "that believed not"? They were the "disobedient," those who "rebelled against the commandment of the Lord."